It’s been a hot start to the school year, but today is a full day of rain and it’s bringing cool, crisp, FALL AIR. I am happy about this. I like summer, but I’m done with humidity and I’m ready for some fall foods. Soups, stews, chilis, using my oven again, and of course, pumpkin things. 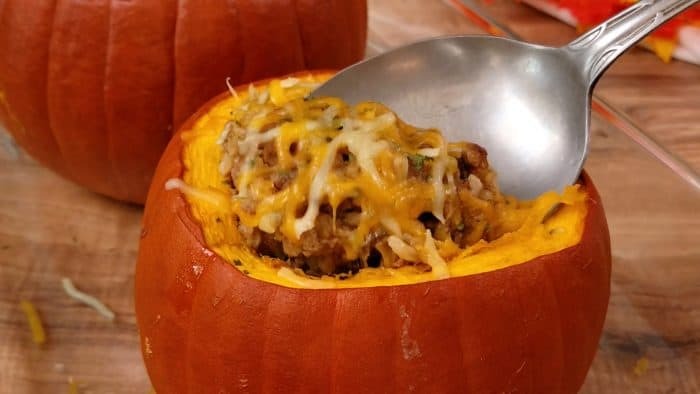 Today we’re going to show you how to make a meal in a pumpkin for your dinner! Pumpkin spice, anyone? While we are fine with pumpkin spice recipes over here, we don’t do pumpkin spice at the dinner table, unless it’s in a glass, not on the dinner plate. Go look at all of the yummy pumpkin spice desserts we shared earlier! 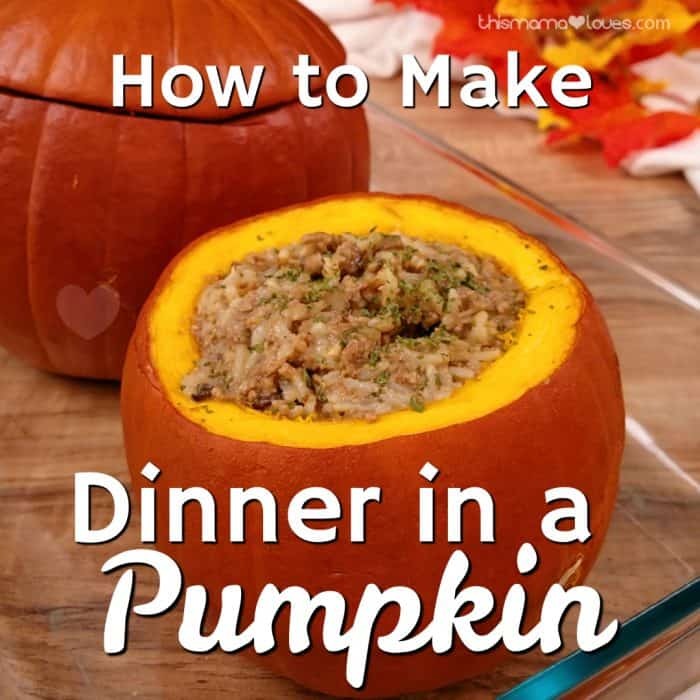 My friend Jenni introduced us to the idea of enjoying a meal in a pumpkin several years ago. She called it dinner in a pumpkin, but for all I know, some of you out there refer to it as supper! 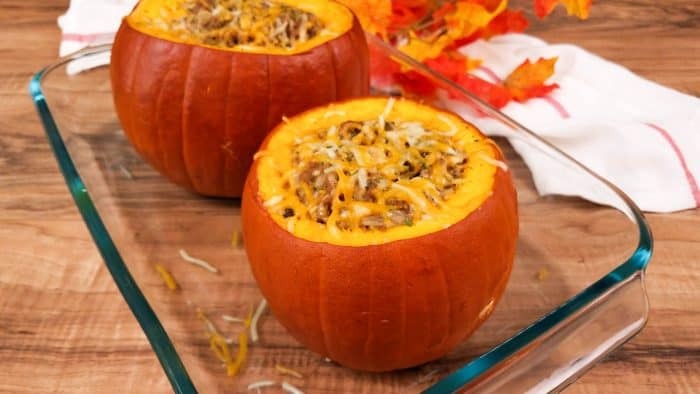 So…this is officially a MEAL in a pumpkin. Grab a small to medium sugar pumpkin at your local store- I’d just get a few, because more pumpkins mean more seeds to roast and enjoy later. 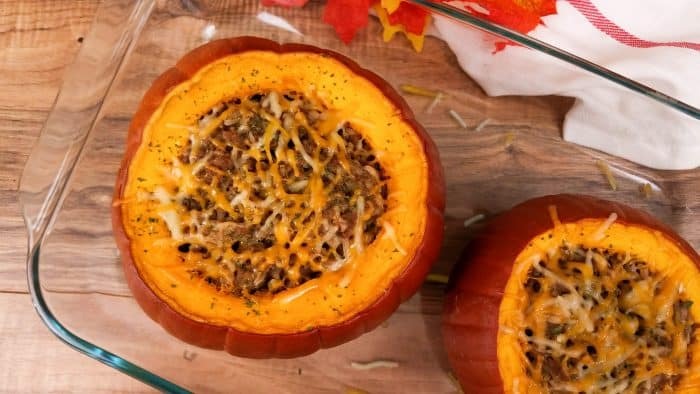 This has a lot of similarities with stuffed peppers- but the pumpkin lends a whole new flavor to your food that may make you fall in love with this perfectly autunmal dish. 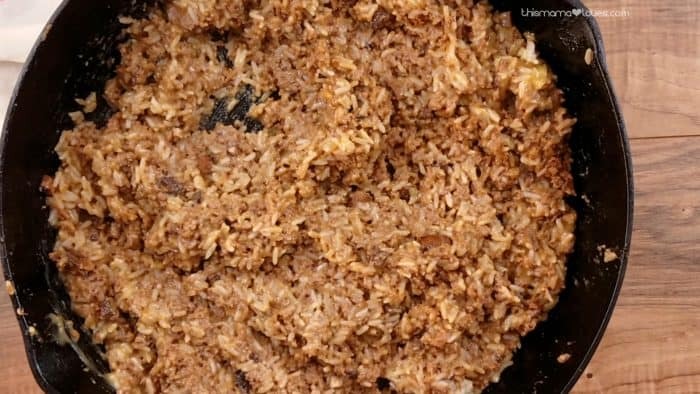 It’s a great one to bring for a potluck, since it’s not so common and is pretty sure to spark some conversation! Cut top off of pumpkin and scoop out insides. Place in oven 375 degrees for 30-40 minutes (until cooked through). Meanwhile, brown meatloaf mix and combine in bowl or in your same skillet with remaining ingredients. 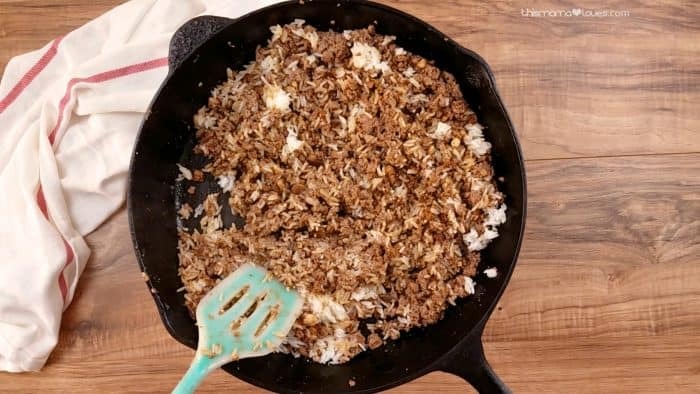 I like to use a cast iron skillet for dishes like this- it’s a really great way to add some extra iron into your family’s diet! 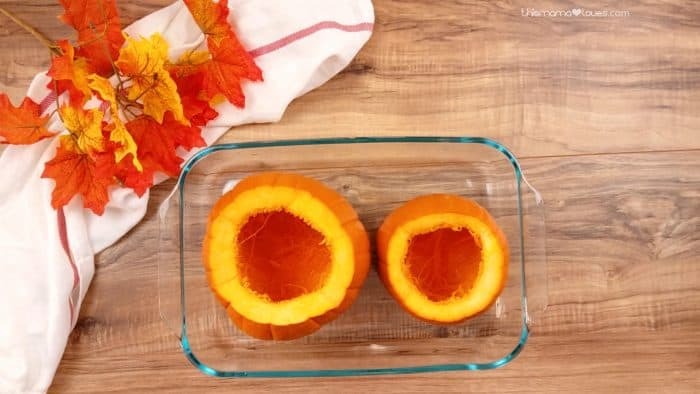 Place mixture in pumpkin and replace top of pumpkin. Cook for an additional 30 minutes to heat through. Serve pumpkin at table. My kids love scooping out the pumpkin for dinner! An added bonus? Roasted pumpkin seeds to munch on! 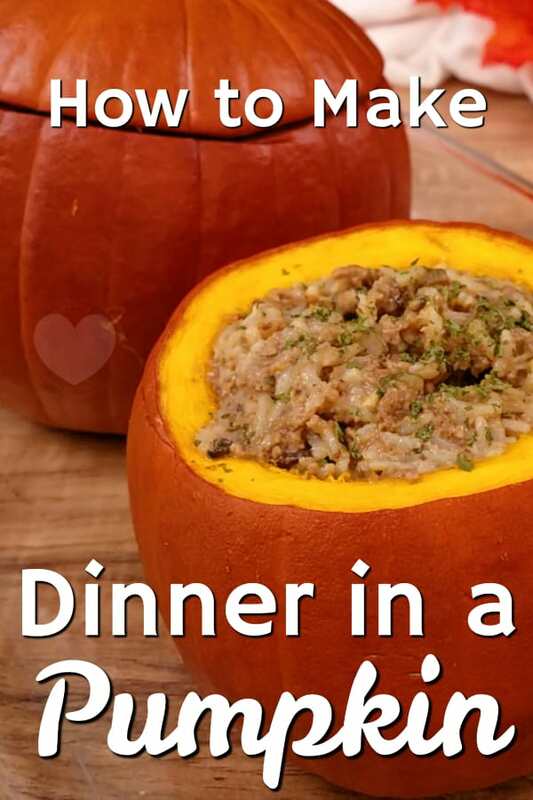 Do you have any fun, seasonal recipes like this Meal in a Pumpkin? 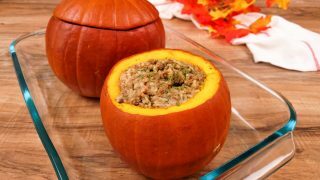 How to make a meal in a pumpkin- dinner in a pumpkin is like stuffed peppers with a whole new flavor twist! 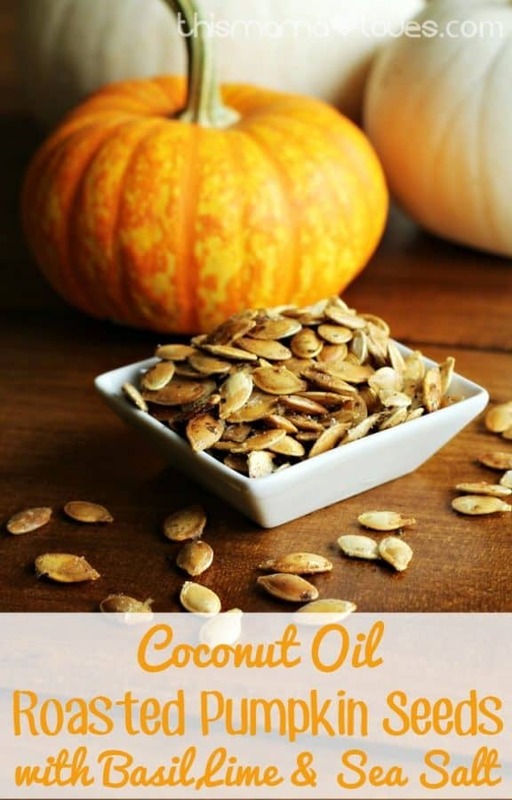 Your new favorite pumpkin recipe! Cut top off of pumpkin and scoop out insides. Place in oven 375 degrees for 30-40 minutes (until cooked through). Meanwhile, brown meatloaf mix and combine in bowl with remaining ingredients. 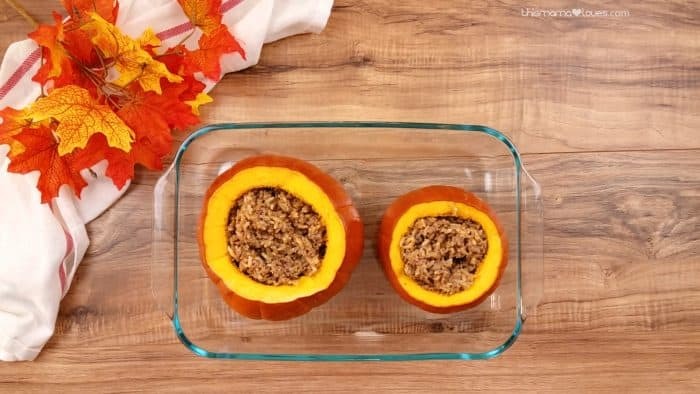 Place mixture in pumpkin and replace top of pumpkin. Cook for an additional 30 minutes to heat through. Serve pumpkin at table. My kids love scooping out the pumpkin for dinner! This’s gonna be a great dish for Halloween dinner! Thank you for sharing the recipe!